Scramble was released by Konami for the first time in 1980. 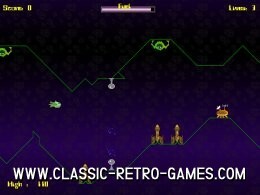 Originally an Arcade game, but it was released for Commodore 64, Atari 2600, Vectrex and others also. This remake brings back memories! Currently rated: 4.5 / 5 stars by 39 gamers.